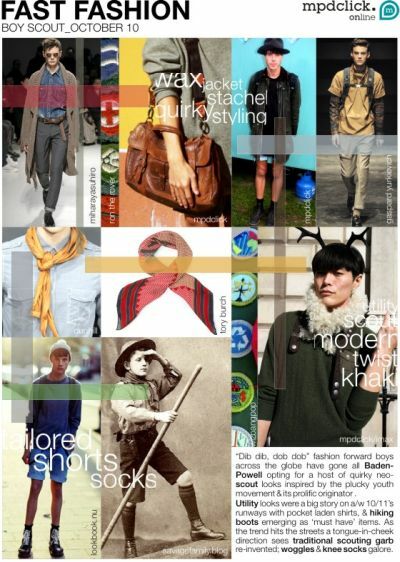 A boy scout aesthetic inspires the latest trend for autumn/winter 10/11 as a modern take on the youth movement hits the streets. Mudpie/Ginger Trend Consulting’s Eryn Behan reports. Traditional boy scout campaign hats and knitted round neck jumpers are essential for autumn winter 10/11, while a khaki wax jacket is the key outerwear item for the season. The season’s runways see a more sophisticated take on the trend with ultra long-line knitted cardigans and full length tailored trousers in neutral hues. Pocket laden shirts appeared along with lace up working boots, keeping that utility aesthetic. In-store, opt for a tailored utility shirt in khaki green with navy tailored cropped trousers and a brown leather satchel. Choose lace up hiking boots over knitted knee socks for that boy scout look, while the must have accessory is an all over print neck-scarf and that signature woggle knot.